The reliable Brother MFC-L3750CDW delivers full featured performance including print, copy, scan and fax for busy home and small offices. The up to 50-sheet automatic document feeder enables multi-page copying, scanning and faxing plus fast print speeds of up to 25 pages per minute. The manual feed slot accommodates varied printing needs and can handle a variety of paper types and sizes including card stock, envelopes and more. The 250-sheet capacity adjustable paper tray helps improve efficiency with fewer refills and handles letter or legal sized paper. Connect with versatile options including built-in wireless, Ethernet or USB interfaces and print wirelessly from mobile devices.‡ Save time by creating custom shortcuts on the 3.7" color touchscreen which also enables you directly print-from and scan-to popular cloud apps including Dropbox, Google Drive™, Evernote, OneNote and more.‡ Brother Genuine high-yield replacement toner cartridges help lower printing costs. Comes with a 1-year limited warranty and free online, call or live chat support for the life of your product. Intuitive connection to the Cloud. Print-from and scan-to popular cloud apps directly from the 3.7" color touchscreen including Dropbox, Google Drive™, Evernote, OneNote and more.‡ Help save time by creating custom shortcuts right on the touchscreen for your most used features. Connect your way. Versatile connection options with built-in wireless, Ethernet and Wi-Fi Direct® or connect locally to a single computer via USB interface. Genuine savings with Brother Genuine toner. Brother Genuine high-yield replacement toner cartridges and toner save mode help lower printing costs. Dependable, durable and compact design. 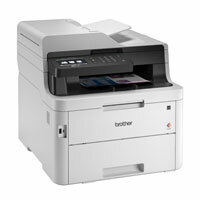 Sturdy and robust construction ensures your printer works as hard as you do; compact design is ideal for smaller spaces. At your side support. 1-year Limited Warranty and free online, call, or live chat support for the life of your printer.